I loved Laura Fitzgerald's first book, "Veil of Roses"; she was kind enough to send me two copies of her new novel, one for me and one for BookCrossing. I ought to state here that my name appearing in the acknowledgements (whee! hooray!) did not have a bearing on what I thought of this new novel! So, we find Meg Clarke, devoted single mother to her son Henry (beautifully portrayed) and enthusiastic, loving teacher to her kindergarten class. She worries about her sister, trapped in domestic servitude, loves her Dad unreservedly, and has a very difficult mother who she only manages to avoid due to Clarabelle having a reluctance to travel more than five minutes from her house. Meg's just about got over being abandoned by her husband when she fell pregnant, and has a good, if slightly narrow, life set up, enjoying living in her apartment complex in a community of odd and interesting folk. Then she meets Ahmed in a cafe. The spark is immediate and mutual. But is it worth stepping out into the fray again for? Meanwhile, around Meg things are changing, people are reinventing themselves and getting or giving themselves second chances. Should she let Ahmed into her and Henry's life? Just what is the state of her parents' marriage as they reach retirement? This is a lovely book. More than a simple love story, we have loads of fully rounded, fleshed-out characters, Henry and Clarabelle, in all her awfulness, being my favourites. Ahmed is a truly yummy romantic interest but also a kind and lovely man, and the scenes between him and Henry are beautifully observed. It's worth noting that the city of Tuscon is almost a character in its own right, portrayed lovingly and taking on a role in the novel. There's an author discussion section in the back which did reassure me that I wasn't going mad - this novel was originally a thriller about a man being drawn into the Iran-America conflict (Ahmed is Iranian American) and I was sure I'd seen a scene early on with a police raid... I was looking for this throughout the book, hoping it wouldn't happen - and it didn't! Anyway, an excellent read with a lovely cover - and I will be offering a bookring for it soon! Lauraloo29 Canada (anywhere) <---- it's here! Received this morning. Thank you Liz, this will be my immediate read starting tonight. I loved the first book 'Veil of Roses', so I am expecting this to appeal to me too. Another superb book by Laura Fitzgerald. Wonderful characters, believable storylines, the type that just absorb you. Ahmed's love of Meg and Henry was wonderful. I also loved the side storylines regarding Meg's parents and one of Meg's schoolchildren Marita. A very touching novel that gets full marks from me! Well Done Laura, keep up the FANTASTIC work!!! Thank you Liz, will be moving this on within the next couple of days! I've just heard from Marlene and she is a little swamped with books at the moment and so has requested that I send the book on to her just after the Easter holidays, thus giving her a few days grace. Marking the book as reserved. This was waiting for me when I went into work today. Thank you Birmingham- Rose I've got a couple of rings ahead of this. Looking forward to starting it though. Thank you so much Lyzzy for sending this book out on a ring. What a great book it was, such a lovely story. One of those books that I didn't want to put down until I'd finished reading it. Will be sending this off to Celticseahorse later in the week when I receive her address. Arrived safely in Cornwall today, already started it, took a few pages to get a hang of the American idiom but now enjoying the humour, wisecracks and obvious love between the mother and son:-) pity I have to go out or I would happily just read this until it is is finished..just the book to help with a very stressful week. Thanks for the ring Lyzzybee a good choice as always. Finished in one sitting:-0 I think I would concur with the 'hokey pokey ' theory of life, or aspire to it at least. I really liked the views of Meg's kindergarten class, and the Lucas and Marita story was very moving. I think the thing that came through most for me was the warmth of the book..or maybe I was just feeling the heat between Meg and Ahmed LOL I wouldn't have minded details of just one more steamy encounter..oops I didn't say that;-0 I think it was the shorts he coached in prompted that thought they were very tantalising. I would love to have this as a book group read as I think it would provoke a lot of interesting discussion, so many subjects are covered adroitly in this well written book..and relationships in many forms have a sharp but loving clear light thrown on them. My only very small tongue in cheek criticism would be, did Meg have to be a size 8? I will have this in the post to Scotsbookie this week, but will try and take it into local library to see if they would consider it for Book Group set list, I don't know if they buy American books for them? Thanks again for the ring Lyzzybee..if there is a copy of Veil of Roses still moving around I would love to read it. A thoroughly enjoyable read, great well-rounded characters. I really enjoyed seeing in to Meg's mind, especialy her thoughts on Ahmed. More than just a love story, Laura Fitzgerald has managed to include so much more: single parenthood, inter-racial relationships, divorcing older parents, an interferring mother & exhusband. I'm very much looking forward to Laura's next book. Thanks for the chance to read the book LyzzyBee. It wil be on it's way to Cross-patch asap. Apologies for my tardiness. Enjoy! Thank you, a Lyzzy book, always something to look forward to. I;m so pleased the postal strike hasn't held this one up. I seem to have quite a few books that have gone on their holidays. Looks like London is bad!! I've been finding it hard to get into books lately, but that was not the case with this Laura Fitzgerald. I remember enjoying Veil of Roses very much, but I may have gained more from the warmth of the world of Meg. It is a chicken soup of the soul read and inspires me to positive, happy thoughts. I have now got the address for the next in line and will go to the post today. Lovely, lovely heart-warming book. Enjoy. It arrived in the post yesterday so managed to avoid the postal strike. I finished my previous book a few days ago so I can start this one straight away. However I am currently using Paul McKenna's I can make you sleep book and one of the requirements is no reading in bed (!!) where I did most of my reading, therefore it may take me longer than usual to finish it. FAO: AKG - have you been able to locate this book and send it on? Thanks! The good news is I have this book and I am so so sorry that I've had this book for so long. I really don't know why it is still in my house as I read it soon after receiving it and I've got a PM from Kerriou with her address on 30th November 2009. I really was under the impression I had no books waiting to be posted. I will check with Kerriou if her address is still valid and get it posted on as soon as possible. I will write a proper review (as much as I can this long after the event) when I come back to say it is posted. FAO akg - did you manage to get an address and post this on? If not, could you please try the next person on the list? Thanks! This is now with me! Didn't think it was on it's way yet. I have two bookrings on the go at the moment so am really not sure if I will get to this much before Xmas Liz if that is OK. I noticed too that Kerriou was next, has she been missed out, or not want it. Do you need to change the order or delete. Who will I contact next! Sorry guys, I forgot to write a journal after I posted this on Tuesday. Kerriou originally sent me her address when I tried to post it in 2009, but when I got in touch to check if the details were still correct I didn't get a response so moved to the next person. It may be worth moving Kerriou later in the list as she may respond in the future. I'm really sorry for the long time I've had this book, I really don't know what happened. I also see I never wrote a proper journal alert so I will add what I remember. Although I was able to start the book straight away I didn't have a lot of enthusiasm for it (probably because I'd been reading a lot of fantasy at the time). However I'd recently returned to work after a year's maternity leave and I either caught a bug from the office or my daughter starting nursery and was stuck in bed and decided to read this book so I could post it on quickly (!!). Once I started it, I couldn't put it down and read it within the day. A very enjoyable read. Sorry for the delay Liz with this book, but am nearly finished the other bookring and this is next on the list. Will be into the new year before I get to it though if that is OK! 10/1/11....due to family stuff I have only just started this one, will get through it ASAP. 17/1/11....hope to be finished this reasonably soon. I thoroughly enjoyed this read Liz thanks for sharing. I liked the mixture of characters and think my favourite was Henry...he seemed to talk sense a lot of the time...lol, so simple and straightforward. Also related the to the 'forearms' thing too!!! Awaiting address from Kerriou Liz or do I go onto the next in line again! 1/2/11.....No response from Kerriou, but I have address for Maria-Nunes so I will post this on to her this week. In the post to Portugal ...happy travels. I had this book in my hands more time than I planned, but I already sent a PM to the next on the list, to keep the book going. Hope the next readers will enjoy this love story! I have been waiting two years for this bookray to reach me which it did safely yesterday. I have a feeling it will have been worth the wait having a quick glance at the reviews. Thanks LyzzyBee for setting this up and to Maria-Nunes for mailing the book on to me. 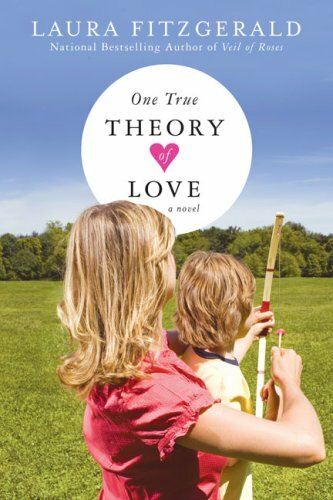 One True Theory of Love disappointed me, after having been on a Bookcrossing Bookring list waiting to read for two years. I assumed it was something I must have wanted to read because I had enjoyed her previous novel Veil of Roses. To be honest I could not remember much about it, so I checked back to my review before writing the review for this one. It seems that did not meet my expectations either. I do seem to be in the minority with my opinion on this one though, if you take a look at what the other Bookcrossers who read it before me had to say. There is nothing to dislike or criticise about the writing or the characterisation, it was just I personally found the storyline a little too perfect and I am sorry to say I got bored. The protagonist Meg a single parent who was abandoned by her husband when she was pregnant with Henry her nine year old son is an intelligent and independent woman. She is a very complicated character, who seems to find it difficult to be completely truthful, in a relationship that seems to be so important to her, I found this disconcerting. The other thing that bothered me was just how easily Henry accepted his mothers relationship with Ahmed. Maybe I was just never going to become emotionally engaged with a novel whose opening line is ‘It’s easy to look at men and think they’re idiots’ as I do not happen to agree! I would still recommend One True Theory of Love to those of you that enjoy this genre and her previous one Veil of Roses. As for me I expect given the opportunity I will still read her recently published novel, Dreaming In English, published February 2011, a sequel to Veil of Roses as disappointment does not equal dislike. En route to Dutchbooky in the Netherlands. Thanks LizzyBee for sharing, LindyLouMac for mailing it! This was quite a quick read! I enjoyed Meg's story and most of the characters in her circle of family and friends. I do agree with LindyLouMac that the storyline was a little too perfect, but sometimes I wish life could be that way. I have PM-ed LyzzyBee, as I cannot contact Mallary through PM. Will wait for her reply before sending the book on its journey. I can't believe how quickly this book made it from Europe to Australia. That's pretty good from experience. It also survived the downpour today - well we've had over a decade of drought so letterboxes are anything but waterproof. I'm looking forward to reading it but have 2-3 books ahead of this one. Still I'm very grateful that it made it all the way downunder so thanks Lyzzybee for organising this ring (no mean feat!) and thanks dutchbooky for the flying postman! Sorry that it took me a while to get reading this book. I had a few 'heavy' books on my TBR and didn't get through them as quickly as I was hoping. Needless to say that One True Theory of Love was a real relief after this, although it didn't start so well for me as I found Meg's son rather brattish at first. I think that his character gets much more rounded as the novel goes on, and that's also true of all the other characters and the story, so in the end I enjoyed it and could not put it down till the end. I've got Veil of Roses on my wishlist and will definitely look for it. I'll be contacting Lauraloo29 over the weekend and will get the book back on its way around the globe as soon as I hear from her. Arrived safe and sound today. Thank yoU!\\u! When this book first arrived and I saw that I was the end of the ray, and I had a huge pile of bookrings, I PM'd LyzzyBee and advised I was moving the book to the bottom of the pile. I see now that another person has been added. I am starting this book this week. Not sure how the last person disappeared and reappeared but just wanted to say I'm happy for Lauraloo29 to take as long as she needs with the book as she's been on many of my rings and rays and I trust her to pass it on! A fun read. Thank you for sharing! Sending as a RABCK to abbyaguas. Enjoy! Oooh, this book is so cool! I haven't read it yet, but I am just excited to pass it on. Thank you for this RABCK! This was a fun book to read. It was somehow hilarious and serious. At least there was almost no boring part of the story. I'm still thinking of where am I going to pass this book. I'll update when it's out of my hands.